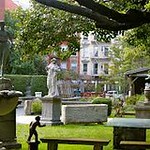 Located in a renovated 1850s New York City firehouse with an adjacent sculpture garden of nearly one acre, Elizabeth Street Gallery represents the vision and efforts of a life-long collector of fine objects. The owner has searched his surroundings and places throughout the world for pieces that are captivating, exceptional, and unique. The Gallery is an intriguing collection of extraordinary pieces in many categories. It represents an aesthetic and a discovery acquired throughout fifty years of world travel.